We believe it is important that we are clear and honest about the results people seeing us are getting. Knowing this helps us and our patients make informed decisions about the treatments they receive. Everyone is different and measuring improvement can be complicated. We approach this believing that our patients know themselves how they are feeling and are best placed to describe any improvement. We therefore ask patients in a questionnaire sent to them online about their pain, how worthwhile they feel any benefit has been as well as their overall satisfaction with the way they have been treated. The results clearly show that for most there is a real and worth wile benefit which starts soon after starting care and that the improvement lasts a long time (at least three months). 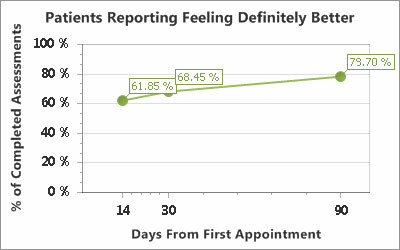 The first graph below shows 79.70% of patients reporting feeling definitely better at three months after treatment. The chart on the right shows patient satisfaction ratings over the past year, and we are delighted that 99.5% of our patients report being either satisfied or very satisfied with the standard of care they have received with us at Salisbury Chiropractic and Physiotherapy. 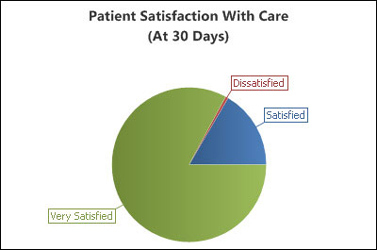 1932 patients included in 2017 results shows that 99.5% are satisfied or very satisfied. There has been a definite improvement in both satisfaction and good outcomes (at each of the 14, 30 and 90 day) assessments.